Darwin's finches continue to give us insight into evolution. On a remote island in the Galapagos archipelago, a bird, nicknamed “Big Bird” by researchers, has clued scientists into the incredible possibilities of evolution. In a report published in the journal Science, researchers from Princeton University and Uppsala University have shown how Big Bird emerged as a new species in only two generations. 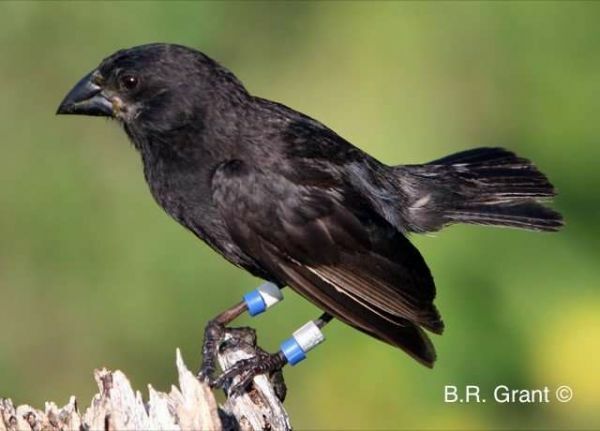 This study came from research on Darwin’s finches on the Galapagos Islands. Because this location is uniquely remote, it allows researchers to almost observe evolution in a bubble, watching the power of nature unfolding right before them. B. Rosemary Grant and Peter Grant, two Princeton scientists, directly observed this evolution on the small island of Daphne Major over the course of four decades. This all began in 1981, when one of the Grants’ graduate students noticed a male bird whose song was a bit different, with a much larger body and beak than the three native species on Daphne Major. “We didn’t see him fly in from over the sea, but we noticed him shortly after he arrived. He was so different from the other birds that we knew he did not hatch from an egg on Daphne Major,” said Peter Grant, an emeritus professor of zoology along with ecology and evolutionary biology. Blood and DNA samples enabled researchers to discover that the strange new bird was actually a large cactus finch of the species Geospiza conirostris from Española island, more than 100 km (62.14 miles) away from Daphne Major. “Big Bird” mated with a native medium ground finch, Geospiz fortis, and created an entirely new lineage of “Big Birds.” This happened because the cactus finch couldn’t fly the long distance back home, so was forced to pick a mate from one of the Daphne Major bird species instead of his own. The researchers involved in this study have noted that such remarkable and fast evolution was made possible by reproductive isolation, which is a critical step in the creation of a new species from interbreeding of two separate species. Before now, it was largely accepted that the evolution of a new species takes an incredibly long time. However, due to the unique circumstances and environment offered by this isolated archipelago, “Big Bird” proved to researchers that the evolution of a new species is possible in just two generations. As pollution and climate change rage on, researchers are finding that evolution can happen when and where we least expect it. We are increasingly finding that, aside from natural anomalies like “Big Bird,” human action can significantly push evolution. From what we put into the atmosphere to how we spread our urban environments, animals all over the world are adjusting and actually evolving.